When Estelle was little, Victoria and Daniel hired Katie Millington from Australia as her nanny. Now they seem to have done the same with Oscar. Margareta Thorgren told to the press today, that Victoria and Daniel have new nanny, Philippa from Australia. Svensk Damtidning writes that they saw Philippa playing football with Estelle and Oscar, and they seem to like their new nanny. Victoria's aide-de-camp this month is colonel Laura Swaan Wrede. Victoria's chambermaid/stylist Tina Törnqvist at NK Galan at Berns on Monday evening with Niklas Ankar. Victoria's chambermaid/stylist Tina Törnqvist attended at Naim Josefi Show at Grand Hotel on 29th August. On 30th August Tina attended at Camilla Thulin Show at Stockholm Fashion Week at Grand Hotel, wearing a Camilla Thulin skirt. Victoria's chambermaid/stylist Tina Törnqvist attended at Vernissage of exhibition ”Margiela, åren med Hermès” at Artipelag on 25th October. "She is a role model, stylist of rank, colleague in the Guldknappen jury but, above all, a unprecedented great friend. Tina!" The main prize, Damernas Värld's Guldnappen was won by Malin Andrén, the founder and designer of By Malina. Elisabeth Tarras-Wahlberg, the former Marshal of the Court of HRH Crown Princess's Household, was interviewed on 1st December at Expressen's "Kungafamiljen"-TVpodcast. Tarras-Wahlberg was also the director of the press and information department before she came the Head of Victoria's Household, and worked at the court for 32 years. The host asks: Vad does a Marshal of the Court do? - A Marshal of the Court heads the so called Household, a royal person's organisation. I helped the Crown Princess to build her Household, her office, her activities. Then you are responsible for planning and implementing the work and servicing the Crown Princess. At first, I was also the Marshal of the Court to her siblings. But it soon became apparent that it doesn't work, there were three people who were all in different directions and had come to a different stage in their official appearances, so after a while, I think so, we chose to focus on the Crown Princess. It feels that the royal family has come more and more folksy. come very popular, Victoria and Daniel are very popular? Would you say that you come close to them when you work with them, are you with them on Fredagsmys ("cozy Friday")? - I can not say I joined the Crown Princess's cozy Friday with her fiancé. But you came close, not least while traveling. Then it happened that you had breakfast together, talked about the day's program. I was commissioned, I remember the Queen said: Elisabeth has been here for so long that Elisabeth knows how we think the things should be. I had been the press officer for so many years, and I had been a mentor for the Crown Princess for a couple of years. She came back from USA and began to take her first steps back to public life. So I helped her and at the same time I was the director of the press department. - Yes, of course, I miss, I miss the daily contacts with my colleagues. It becomes like a big family, we who work around. We all have one thing in sight - to facilitate the work of the royal family. Then it's not so hard nowadays to stay in contact, both with the Crown Princess and my old former colleagues. The host says that when she looked at Victoria visiting the National Library and looking at old photos of Daniel, she started thinking how their relationship began. And you worked with Victoria. How was it noticed that she was in love with Daniel? - Now I have to think about it. As I said before, the private was private. And somewhere, I eventually understood, she met him after she came back from USA because she was looking for a gym simply. Then his gym was recommended for her. And that was when they met. It was not that I noticed that she was at the gym extra often. But she told me eventually, when exactly I can't really remember. But it was also with the media, I remember when they once should go to Ockelbo by car and were chased by a journalist. And it was almost dangerous at the traffic. And then the bodyguards that followed called me and said "Can you help us somehow, because this doesn't work, this hunt is dangerous here in the traffic". So that way I also got to know a little ... I never asked, I know from my own experience that you don't always want to tell. When you think about this, would you say that they wait a longer time than a normal person would do to introduce their new partner to the king and queen? - I don't think it is because of the family, it's still a pretty closed circuit. But when you then take the step in public life, then you want to make sure everything ... that you're really sure. One is so in focus and it has been speculated so long about so many different boyfriends, I remember when I was the director of press deparment, German weekly newspapers began to get crazy with the Crown Princess and mainly about the Swedish royal family. And she was barely a teenager when they began to marry her with Ingemar Stenmark and Crown Prince Felipe, there were new partners every day. It is clear that in that situation you want to be sure that you have chosen the right one. You've been on all trips with Victoria and worked with her, did she ever ask any advice in matters of love ? They show Victoria’s visit to Vienna and the reporter asks: How much they prepare themselves for these kind of trips? - Very much. I don't want to focus on just the Crown Princess. It begins, of course, that you have a correspondnce, you are invited, or in this case the Crown Princess takes her own initiative. You have contact with hosts and plan the time schedule and content, and then the Crown Princess and the royal couple also spend a lot of time reading materials in advance. Sometimes they will give a speech, they prepare for it, they will practice the speech and everything, it takes many hours. December begins, and many major festitivities, Queen Silvia turns 75 years and then then there are the Nobel festivities, it's like a dinner of a official dinner. Is it the same thorough planning for Nobel festivities? - The Nobel festivities, where the royal family are guests, at least when I was employed at the court, it was prepared by that the Nobel Committee came always to the Palace. Where you reviewed the different prizes and the Laureates, they gave information at the meeting and also written information. And then, of course, for the ladies, the hairdos and dresses are coordinated. I'm not going to say it is routine, because there are always new prize Laureates and new programs and so on. But the royal family wants to keep track of the program, they don't want surprises. And then the day after the royal couple is hosting a dinner for the Laureates at the Palace. So then it is a representative dinner. Do they like these festivities? - Yes, I absolutely think so. And I know they see these Nobel festivities and dinner at the Palace as a way to get acquainted with new knowledge and get to know the world, the society, the development. Elisabeth Tarras-Wahlberg, the former Marshal of the Court of HRH Crown Princess's Household, has also been interviewed by IN Stockholm magazine, published in November. Crown Princess Victoria came very close for you. - The Crown Princess's birth was one of my first assignments as the court's PR-assistant, so I've been with through her entire life. Meanwhile, my job was then placed at the Royal Palace, while the royal family, right after the birth of Princess Madeleine, moved to Drottningholm, so when the royal couple's children were really young, we did not meet so often. It was only when the Crown Princess became a little older and began participating in official missions as I became her mentor, and then on her Marshal of the Court, and then we traveled a lot together, which helped us to get close to each other. There are many nice memories and our friendship remains. It is said that during your 32 years at the court, you have never ever "duat" (used the the second-person singular pronoun/to call someone by their first name) the king, is it true? - Yes. And it's not as strange as it may sound. "The king" will be the equivalent of a first name. The Crown Princess and I, on the other hand, say "du" in private but never in an official context, there she is always the Crown Princess. And it is simply about respect for the public office. One clarifies her role as ambassador, both for the royal house and for the country. Victoria's chambermaid/stylist Tina Törnqvist at Tillsammans mot Cancer galan (Together against Cancer) with Nina von Krusenstierna, held at Annexet in Stockholm on 7th January. Expressen writes at their Expressen kungligt Instagram, that Karolin A. Johansson, the Marshal of the Court and Head of HRH The Crown Princess's Household, is leaving her post. - It is very undramatic, there are no strange things in any way, says Karolin A. Johansson. Karolin A. Johansson (37th birthday tomorrow) has been the Head of Victoria's Household since May 1982. She worked in 2006-2012 at the Government Offices, and was the press secretary of the Minister for Culture and Sport when she was chosen as the Head of Victoria's Household. For seven years, Karolin A. Johansson from the Ödängla village outside Mönsterås has been crown princess Victoria's right hand. Now she soon ends her service at the court to change career and become a farmer. - Me and my partner move in the summer home to Mönsterås to take over the farm where I am raised, says Karolin A. Johansson. - In addition to the work on the farm, I will take a few assignments in order to continue to help people and organizations that I know especially for. It was 2012 that Karolin A. Johansson got the job as a Marshal of the court and thus also the responsibility for the Crown Princess couple's official program in Sweden and abroad. - It has been very fun, stimulating and rewarding years. It is a great responsibility and confidence to support and stand behind our future head of state. I am very grateful for the years that I have been allowed to follow the Crown Princess up close. She is undoubtedly one of the wisest, warmest and most ambitious people I have met. Victoria's chambermaid/stylist Tina Törnqvist attended at Stockholm Fashion Week's A/W presentations. Victoria's chambermaid/stylist Tina Törnqvist at Camilla Thulin's fashion show at Operakällaren, 8th February. With fashion designer Niklas Ankar. Victoria's chambermaid/stylist Tina Törnqvist with Niklas and Ann Ankar at the inauguration of NK's new market hall in Stockholm, 6th March. Victoria's chambermaid/stylist Tina Törnqvist with Niklas and Ann Ankar at the inauguration of Smarteyes concept store in Stockholm, 21st March. Victoria's chambermaid/stylist Tina Törnqvist with Christina Stielli at the release party of Camilla Läckberg's new book "En bur av guld" at Nio Rum, 9th April. 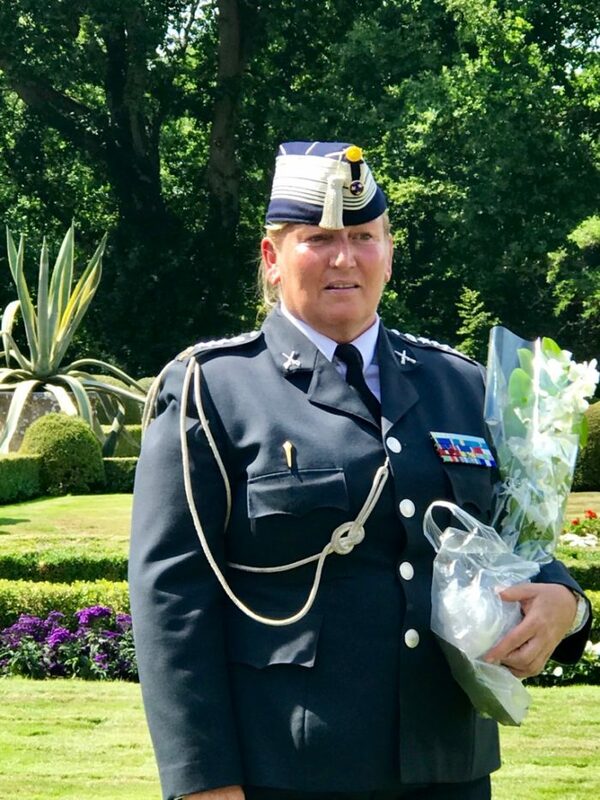 One of Victoria's aide-de-camps, colonel Laura Swaan Wrede, the commander of Livgardet (The Life Guards), visited Swedish Armed Forces Dog Breed Station in March and met the Guards' cutest employee, called Krixa.